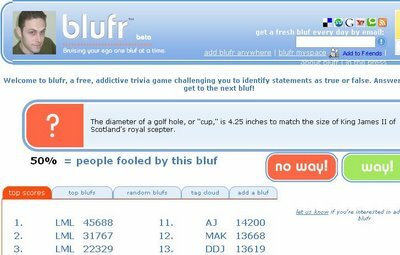 Blufr is a simple game from the owners of Answers.com: you answer true or false when presented with a random "fact". The score you get at the end is the result of both real and fake measures so it doesn't mean much, but the game is somewhat addictive. Much like Google Image Labeler, Answers.com has transformed a dry, boring subject matter into an interactive game. I wonder whether a modified Blufr could be used to train a neural network or a Cyc-like artificial intelligence. There are generally two schools of thought on AI: the bottom-up and top-down perspectives. Bottom-up is essentially starting with simple rules in the hopes of getting emergent properties. Top-down is like Cyc, which is based on a vast collection of facts. The idea is that Cyc can answer questions by parsing them with natural language processing and going into its knowledge base to answer them. Getting a high quality database of facts is hard since you can quantify so many things. A Blufr-like game would be a quick and dirty solution, speeding up the process significantly.